The 21st century ushered in the dawn of a new millennium; a new start filled with hope and promise. From an energy point of view, this beginning could also be viewed as an opportunity to change the status quo from the current utilization of polluting and finite carbon-based sources. One could argue that transitioning from polluting sources of energy to cleaner sources is going to be one of the biggest challenges of the 21st century. This movement requires a significant change in how energy is generated, and of all the clean energy sources available the one that offers the most potential is solar energy. A well-known fact of this non-polluting energy source concerns the potential on offer: a single sixty minute time period offers the possibility of generating more electricity that what is required to power the world for a whole year. Therefore, solar energy technology offers the prospect of deriving a considerable amount of energy from a clean and non-polluting source. To fully exploit this renewable source of energy, in the same spirit as the promise of a new millennium, will require the use of current models of solar technology and innovative versions as well. Breaking the mold on the developments within solar energy technology will allow for this promise to be reached, and with the recent creative developments put forward by Professor Jeffrey Grossman, a solar-led future does indeed look closer. Through the development and use of solar energy technology, in particular through the use of solar cells and modules, this unlimited power source can be harnessed. However, this harvesting of solar energy is far from simple. The current technology is a good step in the right direction and has provided a good platform from which to begin this long journey, but unfortunately this technology suffers from two limitations. One limitation focuses on the electrical energy conversion rate, and the second limitation is on the manufacturing costs. Over the decades, solar energy technology has matured from the conventional silicon-based first generation solar cells/modules to silicon and non silicon-based second-generation solar cells and modules. First generation solar technology is the industry workhorse, and is mainly found as rooftop installations or as ground-based installations. Second generation models are also known as thin-film solar cells/modules, and this is due to the extremely favorable dimensions they possess. This extreme thinness offers a degree of flexibility that in turn is exploited for integration into the façade of buildings, allowing for the prospect of solar homes and office buildings to be constructed. 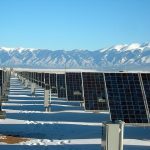 First generation solar technology remains the most popular choice for solar utilization but second generation solar technology is expanding rapidly, especially with new building projects. In addition to these two generations, third and fourth generation solar technology is slowly gaining more interest. While third generation and fourth generation solar technology looks promising as a future piece of technology, it is currently mainly an academic interest. The belief is that third and fourth generation solar energy devices could break free from the Shockley–Queisser limit of 31-40%; this limit states that the maximum theoretical efficiency of a typical solar cell is at best 41%, so third-generation devices are hoping to exceed this limit. In addition to the multi-generational family of solar cells and modules, progress in this field can also be achieved through revolutionizing the whole concept of a solar cell and/or module. Professor Grossman, from the Massachusetts Institute of Technology (MIT) in the USA, through his innovative and unique approach, has done just that. Solar technology, in its current state, is a two dimensional concept that is efficient at generating electricity only at certain times and at certain angles. By altering the dimension state, from 2D to 3D, the hope was that these restrictions could be eliminated. In 2011, Professor Grossman and his research team were working on energy storage devices based on nature. By working on this, Professor Grossman was moved to investigate 3D structures. The research team created a computer algorithm and then published designs showing ‘evolved’ solar cells (full details can be referenced from an earlier article posted on Energytrend: Incorporating Solar Cells with a Different Dimensionality). In short, these designs were predicted to harvest sunlight at a better rate while occupying the same base area as traditional 2D solar cells and modules. Figure 1 is an illustration of the computer-led designs for the evolved solar cells. Figure 1: Computational images of ‘evolved’ 3D structures for solar cells. Credit: Grossman Research Group, Massachusetts Institute of Technology. Current solar energy technology devices are somewhat confined by how much sunlight the device can absorb. For a variety of reasons, from cloud cover to geographical positions, the electrical energy efficiency rates are affected and this becomes a limitation of the solar device. By shifting to 3D, these problems become irrelevant. Low-light caused by cloud cover will not matter as 3D solar cells collect sunlight at low angles and also retain sunlight within the internal structure of the solar cell for longer. This means that 3D solar cells can improve their efficiency rates, as retained sunlight will allow for an increase in the number of photons kick-starting the electron ejection process. Another attractive feature to using 3D solar cells concerns the number of mechanical parts. Due to their impressive ability in absorbing sunlight at a variety of angles and weather conditions, expensive trackers could be removed from silicon-based traditional solar modules. In certain silicon-based solar modules, these trackers enable the module to be tilted at suitable angles to absorb sunlight as the sun traverses the sky. With these novel 3D solar cells and modules, trackers would be redundant as these unique cells and modules are able to absorb light better and possess far greater efficiencies. In March 2012, Professor Grossman and his research team proudly displayed small-scale prototype models of their clever 3D solar cells as based on their evolved designs. Figure 2 is a photograph of a close-up of two of the 3D prototypes, and Figure 3 is a photograph showing three different models of the 3D prototypes. 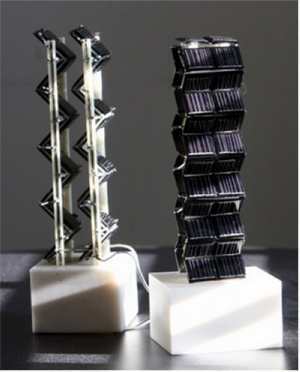 Figure 2: Small-scale models of the 3D solar towers as put forward by the Grossman Research Group. Credit: MIT News. Figure 3: Three different prototypes of the innovative 3D solar cells/modules as put forward by the Grossman Research Group. Credit: MIT Technology Review. By subjecting the 3D solar prototypes to a wide variety of environmental conditions (caused by different latitudes, changing seasons, and fluctuating weather patterns), the Grossman research group discovered that their 3D structures were twenty times better at generating electricity than the equivalent 2D planar structure. Furthermore, the 3D structure allows for a stable and regular power output that will benefit grid integration immensely. The design of the 3D tower is at the heart of the reason why the structure is better at generating electricity. The vertical face of the 3D structure is a better collector of sunlight at low angles; when the sun is closer to the horizon (early mornings, early evenings, and during winter), these 3D structures are able to better harvest the low levels of light. Reducing the manufacturing costs is a significant step in developing a solar-led future. These 3D solar cells/modules might not help immediately with reducing the material cost of manufacture, but these cells and modules will be without expensive trackers. 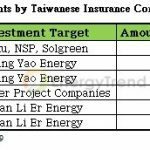 As material costs usually account for 35% of the actual solar cell or solar module, and with the price of silicon rapidly falling, these creative solar cells and modules with higher efficiencies will justify the financial outlay. A second advantage concerns installation (a major part of the balance 65% of the normal total cost of a solar cell/module). One aim stated by Professor Grossman is to offer these cells and modules in an easy-to-assemble manner. The solution is through flat packing. By selecting designs that had the least manufacturing complications and offered the clearest packing solutions, the hope is for a 3D solar structure to be flat packed and shipped to the buyer where it could then be easily assembled by a process of unfolding. Altering the designs predicted by the computer program to suit the process of flat packing might have changed the power output in a considerable way. Thankfully, by selecting designs that were simple, and by tweaking the designs so as to produce a simple cube-like structure, the altered structures had a power output that was 10 – 15% lower than the optimized computer-led designs. With the significant boost to the efficiency rating, this loss in optimization was acceptable. A simple cube with the same base footprint as current solar energy technology, and with a substantially higher power output and electrical efficiency, sounds almost perfect in following one of the general rules of evolution in nature: do (or receive) more with less. The promise of these amazing 3D solar cells and modules is quite clear, even though the results were based on the use of small-scale prototypes. When these prototypes are fully commercialized, the opportunities for use become limitless. One interesting application concerns the development of electric vehicle charging infrastructure. By installing these 3D solar towers at charging stations, one could theoretically have an elegant solution to one of the biggest issues holding back the wide-scale introduction of electric vehicles. These altered 3D designs, and as manufacturing technology improves the range should include the original optimized designs, could be used for a whole raft of applications: building fixtures, rooftop installations, and nationwide infrastructure such as roads and railway lines could be converted into solar collectors, thus assisting in the development of a solar-led society. With a simple yet smart design, coupled with an immense gain in power output of twenty times, the 21stcentury might just be when society realizes certain hopes and fulfils its potential. A new dimension, a new impression; this truly is the shape of things to come.